The Golden Knights continued to hurt the Sharks in the opening moments of periods. Mark Stone dropped the puck off for Pacioretty, who promptly snapped a shot through a screen for his third goal of the playoffs. With his assist, Stone became the eighth player in the last 30 seasons to have 10 or more points in his team's first four games of a post-season. Tuch's goal marked the 13th time San Jose defenceman Erik Karlsson was on the ice when the Golden Knights scored. The Sharks acquired Karlsson in September with hopes of bolstering their defence, but neither him nor Burns have played like All-Stars during the series. NOTES: The Golden Knights are the first team in NHL history to score in the opening 90 seconds of four consecutive post-season periods. 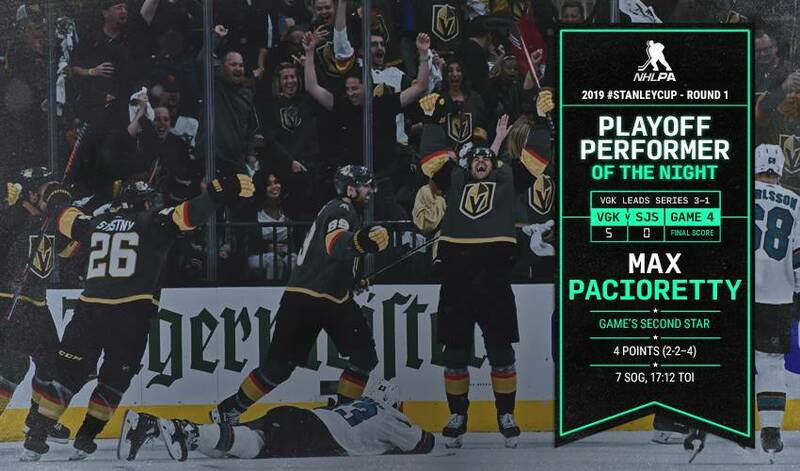 ... Pacioretty's first goal marked the 10th time in 18 games the Golden Knights scored in the opening five minutes against San Jose. ... The second line of Pacioretty, Stone and Paul Stastny has generated 28 points in the series, while the rest of the team has 21 combined.